"Coleslaw made up and put in the freezer. Easy to take out and thaw when you need it in a hurry. It does have a crunch to it and a sweet-sour vinegar based dressing. Freeze for up to two months. Chopped onions and bell peppers are an option to add in if you like them." Mix shredded cabbage and salt together in a colander; drain for 1 hour. Squeeze moisture from cabbage. 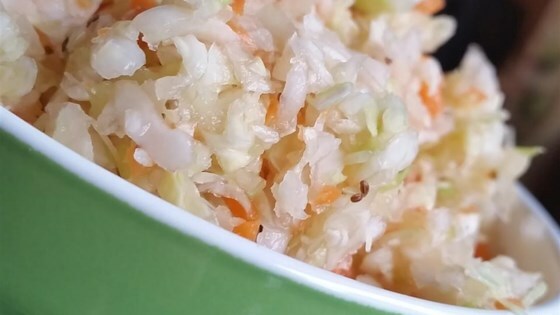 Stir carrots into cabbage and divide cabbage mixture between pint containers. Whisk sugar, vinegar, water, celery seed, and dry mustard together in saucepan over medium high heat; bring to a boil for 1 minute. Cool. Pour cooled vinegar dressing mixture over cabbage mixture, cover containers, and freeze. Thaw before serving.